I have recently made this bag 3 times. The first time was for myself and sadly...there were a few changes I would recommend making that I figured out after the fact. The next two were for friends' recent baby showers. I hope this review will help out others who are considering this pattern. Did it look like the bag on the envelope when it was completed? For the most part, yes. 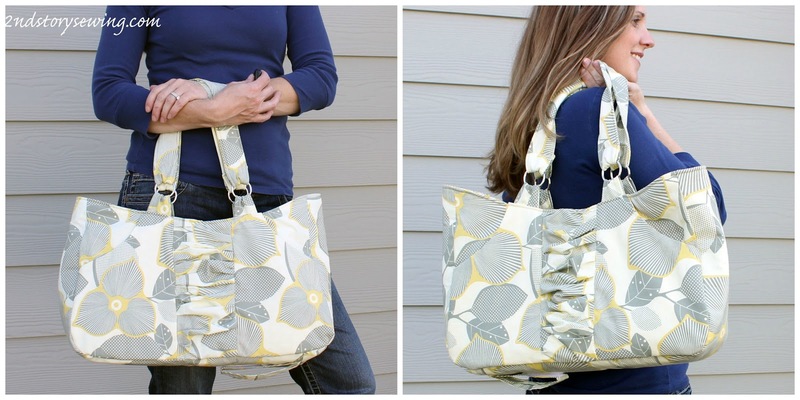 I did not use accent fabric for the scrunch or side panels- I thought it would be too busy. For my own bag, the blue Amy Butler Fabric one, I deleted the scrunch due to a lack of fabric. What modifications/alterations did you make? The biggest change I made was the addition of Peltex. I did not use any additional interfacing in the first blue bag (Amy Butler) and I hate how the sides fold in all the time. It seriously drives me crazy. 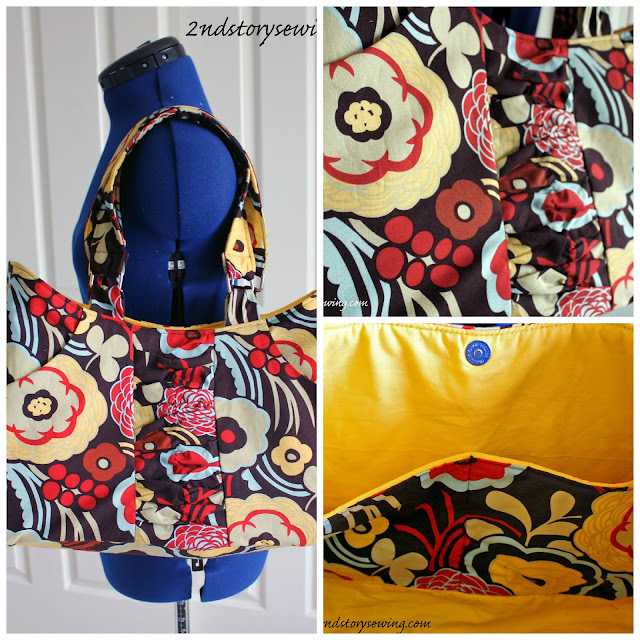 In the yellow/gray Amy Butler fabric bag, I added the fusible fleece to the center panel and added a false bottom. This helped make it sturdier but on the third bag (Alexander Henry) I added Peltex to the center pieces. This created a bag that could stand up on its own, retained its shape, and the sides don't fall in. I also decided to omit the two fabrics on the strap and use the exterior fabric on both sides. Finally, I added velcro to the underside of the toddler strap in the yellow/gray bag to help it stay up and out of the way when not in use. Well, this is a hard one for me to answer. I wouldn't say they were real clear. There were several parts I had to reread that I think could have been explained better. In addition, this bag would not be good for a beginner. 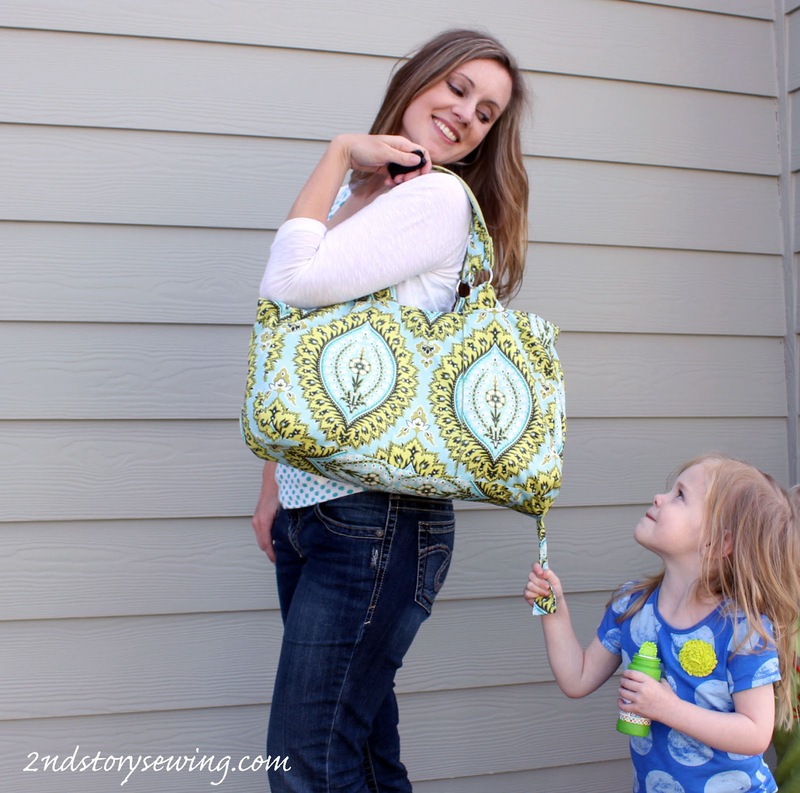 If you haven't made bags before, you could get very discouraged. Some directions are completely missing. For example, there is a magnetic snap mentioned in the supplies needed, yet there is no mention of inserting it in the pattern. There are also no pictures, so the steps that can be confusing are not made easier by having photos. While I like this pattern and obviously have made it several times, I have to be honest and say that the directions could be a little more clear. The above bag is made with Amy Butler Alchemy Organic in Blue Sky Imperial Paisley. My daughter is modeling the toddler handle. Would you recommend it to others? If you have sewn bags before, yes. I would not recommend it for beginners due to the instructions. Will you make it again? I am sure...three times so far, I bet there will be more. This bag is created with Alexander Henry Fabric Mocca in Chocolate with a quilting weight golden rod for the interior. This bag also uses rectangular strap hardware. 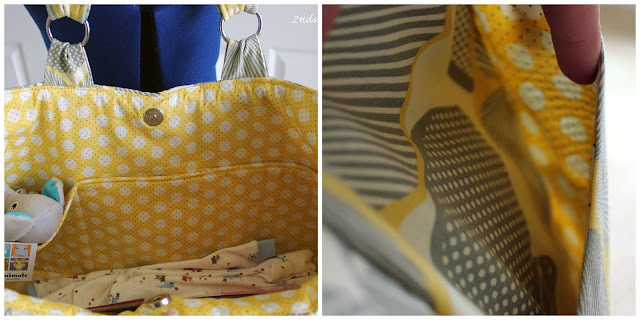 The yellow and gray bag is made with Amy Butler Optic Blossom and DS Quilts Collection-Farm Stand Dots Yellow on the inside. Overall, I am very happy with this bag after the modifications. I love all the pockets this pattern includes and the scrunch detail is cute. 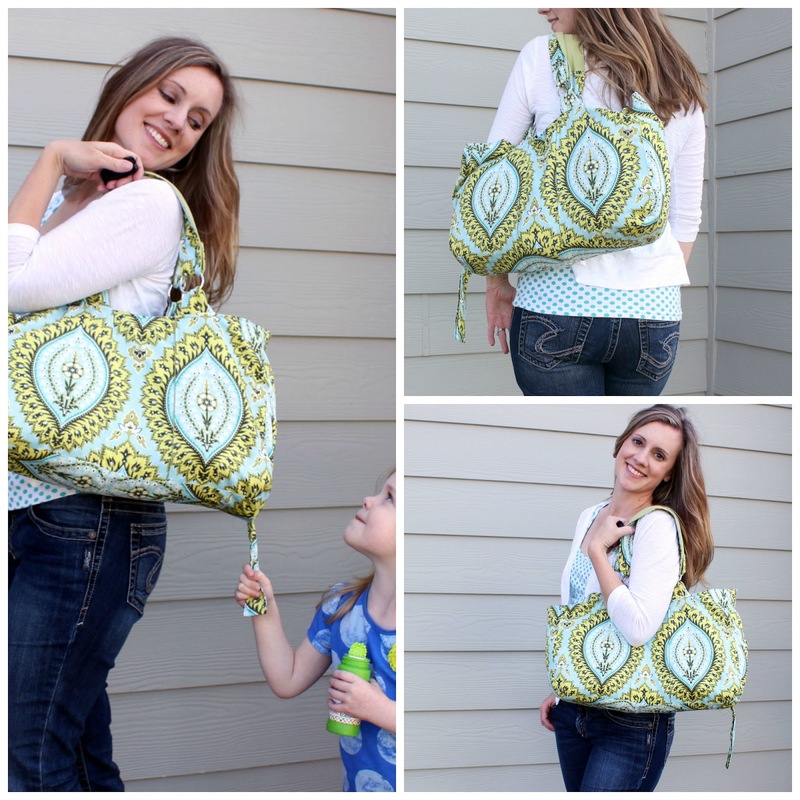 I hope the new mommies get some great use out of this diaper bag. I wish I had a baby on the way, so I could have you make me one. :) You're so talented. Great job! What a cute bag! And you made three! Thanks for the review.